A guide about how to use the new player account system. in this guide you will learn how to connect your forum account to your OpenRA installation and how to use the player account features. Start OpenRA and click on "Connect to an OpenRA forum account". Open your browser and visit this forum, sign in with the username and password you used when you registered the forum account. When you are signed in, click on your username in the top right corner so that the menu below pops up. Click on the link to the "User Control Panel". You should now see the page below. 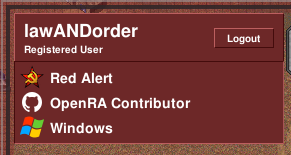 Click on the tab "OpenRA profile". Now paste the key generated by OpenRA. Remember that the key was copied to your clipboard, so if you have copied something else in the meantime, you will have to go back into the game, click "Cancel" and start at step 1 again. Submit the key and accept the service agreement that is shown when you paste your first key. You should now be able to connect OpenRA to your forum account. Switch to the game again and and click "Continue". The game should now display your forum username in the top left corner. 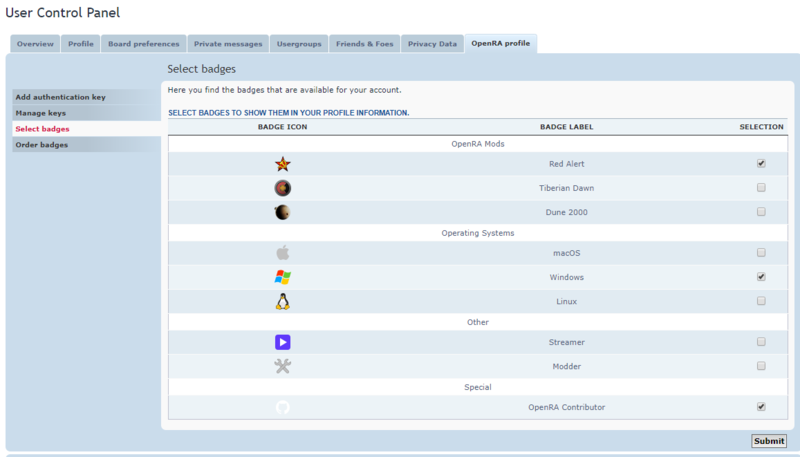 You can customize the look of your profile by selecting badges that are available for you. There are various default badges that are available for everyone and special badges that are awarded individually. See viewtopic.php?f=82&t=20613 to learn more about the current set of special badges and their requirements. 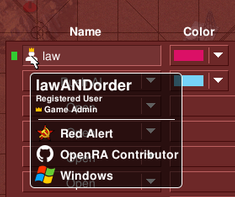 Visit the "User Control Panel" and click on the "OpenRA profile" tab. Click "Select badges" in the menu on the left and mark the badges that you want to display in your game profile and click "Submit". You can mark as many badges as you want but only a maximum of 5 badges will be displayed in your game profile. Now click on "Order badges" menu link. Use the arrows to change the position of your selected badges. Switch back to the game and you should see that the selected badges have been added to your profile. Your profile will be visible for other players in the lobby when they hover over your player indicator. Congratulations! Your forum account is now connected to your local OpenRA installation. You can change your badge selection anytime without pasting a new key. You can also connect OpenRA to your forum account from other devices by generating and uploading a separate key. If you want to revoke a key you generated and uploaded, just click on the "Manage keys" menu item and revoke the key(s) that should no longer be used to authenticate you. Note that you will need to generate and upload a new key when you click on "Logout" in the game.